The food scene in St. Louis is quite diverse, with a wide variety of options from around the world. And when you're hungry for something new, a food festival can be just the thing to satisfy your appetite. After all, where else can you sample so many different kinds of cuisine all in one place? Most local festivals also offer a lot more than food. There's live music, cooking demonstrations, kids activities, wine tastings and more. Calling all wine lovers! The Food and Wine Experience is the event for you. This three-day festival held each January is billed as the largest international fine wine and food festival in the Midwest. Each year, vendors select more than 500 wines for sampling from growing regions across the globe. The festival also includes gourmet appetizers and small plates to compliment the wines, so everyone who attends can enjoy a full culinary experience. For an extra treat, there are VIP packages offering the chance to sample hard-to-find and specialty vintages from premium wineries. Money raised from the Food and Wine Experience benefits the Repertory Theatre of St. Louis. Oysters and beer are the stars of this popular annual festival at the Schlafly Tap Room. To make sure the food is top notch, the brewery flies in more than 50,000 fresh oysters every March, along with teams of expert shuckers to serve them up. The oysters taste best when washed down with any of the fine varieties of freshly brewed Schlafly stout on tap. The festival also includes live music and a full menu of pub food for those who may want to eat something other than oysters. This popular food festival takes place near St. Louis in the heart of Missouri wine country. It's a celebration of German culture and food held each March. Hermann's best-known wineries serve up all kinds of sausages for sampling, along with other German fare like sauerkraut, potato salad and strudel. If you don't know the difference between a bratwurst and a knackwurst, you can learn all about it here. There are also sausage-making demonstrations, a whole-hog sausage breakfast hosted by the Hermann Fire Department and wiener dog races at Hermann City Park. St. Louis' most popular food trucks all gather in one spot for an evening of culinary delights during the warm weather months. Nearly two dozen food trucks participate each night offering everything from street tacos and gyros, to kebabs and cupcakes. This is one event where it's best to arrive early because the lines get longer as the evening goes on, and the trucks often run out of their most popular items. For those who also like to try a new brew, Food Truck Fridays feature craft beer from local breweries like Urban Chestnut and 4 Hands Brewing Co. Strawberry season is a great time to visit Eckert's Orchards in the Metro East. The Strawberry Festival is held over several weekends each May. During the festival, Eckert's offers up all kinds of strawberry cakes, jams, breads, pies and more. You can indulge in a few treats while you're there or buy from the Country Store to take home. Another highlight of the festival is the chance to pick-your-own strawberries right from the fields. For the kids, there are plenty of activities including pony rides, a play area, carnival rides and inflatables. St. Louis may not be famous for BBQ like Memphis or Kansas City, but some of the country's best BBQ teams come to town for the annual Ribfest over Memorial Day weekend. This is not a competition, but rather a celebration of all things BBQ. It's your chance to sample many different styles of BBQ from some of the top chefs in the nation. Local favorites like Pappy's, Bogarts and Salt + Smoke often participate as well. Whatever you are hungry for, there are plenty of sweet, spicy and smoky ribs, along with pork steaks, pulled pork, brisket, chicken and more. Ribfest also has live music each day and a large play area for the kids. One of the more unusual food festivals in the St. Louis area is the International Horseradish Festival in Collinsville, Illinois. The Metro East town hosts this annual celebration because Collinsville is one of the largest horseradish growing areas in the world. Fans of the pungent and spicy root can try it in all kinds of dishes from chicken wings and sausages, to Bloody Marys and burgers. More adventurous eaters might even consider trying the horseradish beignets or ice cream. If you still can't get enough, there's also freshly ground horseradish bottled up to take home. Other activities at the festival include live music, an amateur recipe contest, a horseradish root toss and a root stacking competition. The Festival of Nations isn't just about food, but cuisine from all around the world is a huge part of the celebration. The festival's International Food Court has vendors from more than 40 countries offering everything from Cuban empanadas and Ethiopian injera, to Filipino kebabs and Indian naan. Foods and flavors from around the globe are well represented every year, making it a unique opportunity to try something you've never had before. The Festival of Nations also showcases ethnic music and performers, as well as merchandise vendors from many countries. If you can't get enough chicken wings, then Midwest Wingfest should be on your list of top local food festivals. The two-day festival is held over the Labor Day weekend. It's both a competition and a food festival with dozens of kinds of sweet and savory wings. Those with a biggest appetites can compete in a wing eating contest. While wings are the focus of the festival, the menu does include other items like pulled pork, burgers, hot dogs and more. There's also live music, children's activities and a 5K run. The St. Nicholas Greek Festival is a Labor Day weekend tradition in St. Louis and the food is always one of the best parts of the celebration. Members of St. Nicholas Church serve up authentic Greek cuisine like lamb shanks, gyros and spanakopita. There are also pastries, cookies and baklava to satisfy your sweet tooth. Along with the food, the festival features Greek music and dance performances, a gift shop with jewelry, art and other imported items, and free tours of the church. 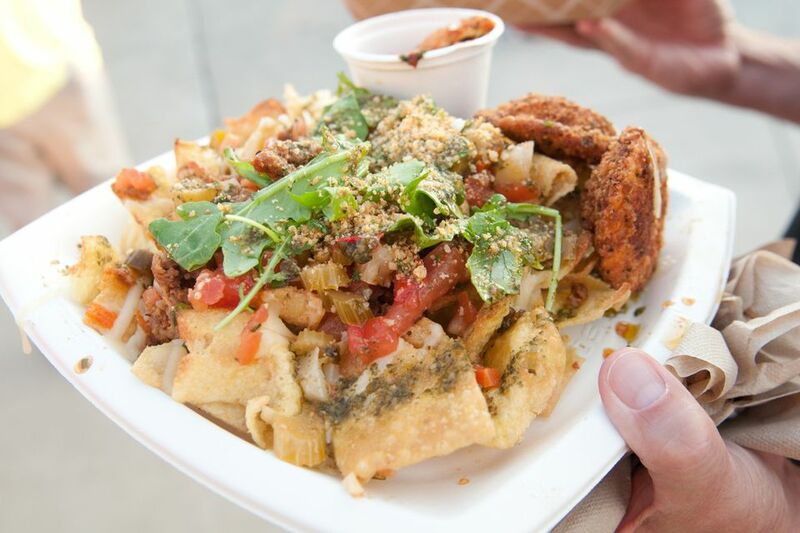 The Taste of St. Louis is the area's premier annual food festival. It brings together more than 35 top local restaurants for a three-day celebration of the St. Louis food scene. The restaurants set up shop along Restaurant Row offering up their most popular entrees and desserts. The festival also includes cooking demonstrations and appearances by nationally-known chefs. For local chefs, there is the Battle Royale culinary competition. Nine of St. Louis' best restaurant chefs compete on stage in a series of food battles throughout the weekend. One winner is crowned as the champion at the end of the festival. In addition to all of the food, there's also live music, an ArtWalk featuring the works of 30 regional artists and a Kid's Kitchen with edible projects, cooking classes and take-home treats for the youngest attendees. The biggest event of the year in the small town of Kimmswick, Missouri, in Jefferson County is the annual Apple Butter Festival. Nearly 100,000 visitors attend this two-day festival each year. In fact, the town shuts down to vehicle traffic during the celebration. Visitors park at the edge of town, then take a shuttle or walk to the festival area. Kimmswick has an old-fashioned charm that's easily on display during the Apple Butter Festival. Prior to the festival, volunteers peel, core and chop hundreds of pounds of apples. Then the apples are cooked in giant copper kettles to make Kimmswick's famous homemade apple butter. Visitors can eat the fresh apple butter on the spot or buy it to take home. The festival also has dozens of other food vendors and hundreds of craft vendors selling all kinds of items. For more ways to enjoy the local food scene, see St. Louis' Most Famous Restaurants and Food Finds and 5 Cool Stores for Foodies in St. Louis.